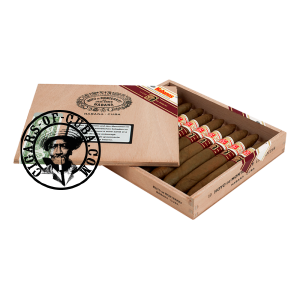 A cigar for aficionados enjoying taking time to smoke. This Perfecto produces dense smoke, with an easy draw after a couple of puffs and constant construction, resulting in a even burn. With its amazingly looking brown oily wrapper, although a little veiny, this Cuban cigar releases strong aromas from leather to almonds. One can distinguish leather, cinnamon, and creamy oak notes, among other flavors throughout the thirds. This limited edition for LCDH is one not to miss!